All transactions are safe and secure with a reliable history in online purchasing behind each of our associates. 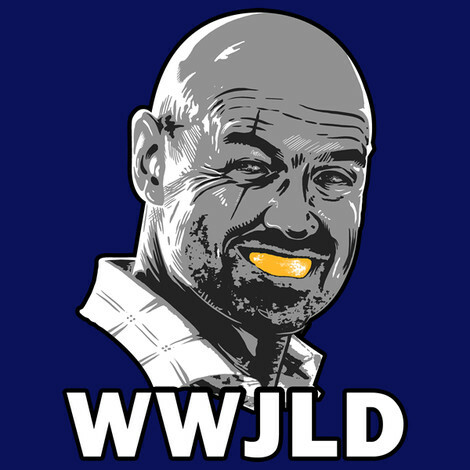 Buy the What Would John Locke Do? t-shirt to own Lost clothing and merchandise. "What would John Locke do?" is a question that just might help you to survive on a seemingly deserted island. John Locke is a survivalist and a man of faith, the opposite of the secular realist Dr. Jack Shepard. Wear this design to fight the smoke monster or escape from the Others' Island and their settlement of Dharmaville. This Lost merchandise item celebrates the man who never wanted to leave. The front of this Lost shirt reads, "WWJLD?" Wear it on your next camping trip or day of hiking in the woods with your friends Jack and Kate. In addition to the What Would John Locke Do? tee above, browse the Lost Clothing Gallery for more apparel like men's and women's clothes, kids shirts or hoodies.